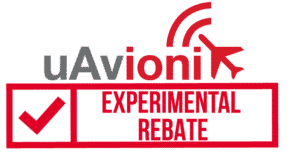 uAvionix today announced it has launched a manufacturer’s rebate program for its ADS-B OUT solutions for experimental aircraft owners. The rebate program offers a limited time $100 rebate on the echoUAT+WAAS GPS bundle, or $150 rebate on tailBeacon EXP. Purchase echoUAT+SKYFYX GPS bundle, echoUAT+SKYFYX EXT GPS bundle, or tailBeacon EXP from uAvionix or one of our trusted resellers between Sept 15, 2018 and Nov 15, 2018. Install the product(s) on your experimental or LSA aircraft. Conduct an operational test flight and obtain a passing Public ADS-B Performance Report (PAPR) from the FAA. Submit proof of purchase, installation photos, passing PAPR, using the uAvionix’s rebate validation form by Jan 31, 2019. Receive a prepaid VISA debit card! Visit the uAvionix Rebate page for additional details.